Home > News - May 2016 > Why All Equity Mutual Funds Are not the Same? Why All Equity Mutual Funds Are not the Same? Read a review of an equity mutual fund or look at their ratings and you will always find a mention of large-cap or / mid-cap or / multi-cap. For a newbie investor, this can muddle decision-making. One-year returns of mid-cap funds are much higher than large-cap funds, so are they the best? There are different types of equity funds and each plays a different role in your portfolio. You need to choose the right type of fund, and in the right allocation. Large-cap stocks (or blue chips) are usually established or large companies. They have strong product offerings or services, high revenues, and are often dominant market players. These companies are able to borrow at better rates or raise capital through other sources much easier than their smaller counterparts. Because of their size & experience, these companies are able to withstand bad patches or if business decisions go awry. For example, consider Hindustan Unilever, a large-cap stock with a market cap of Rs. 1.91,512 crore. By virtue of its diverse presence (soaps, detergents, personal care, foods) and long list of strong brands (Surf Excel, Vim, Ponds, Lakme, Knorr, etc. ), it is more stable and less vulnerable to a prolonged slowdown than a smaller company like Agro-Tech Foods, that operates in a narrow field (oil and readymade food) with few brands (Act II, Sundrop). Agro-Tech Foods has a small market cap of Rs. 1,193 crore. On the flip side, a smaller company can grow much faster than a large company. They are more agile and they have several unexplored growth avenues open to them. Often, these companies challenge the dominant market player. However, smaller companies are risky; if their growth strategy fails or / if the business environment sours, they fall hard as they aren’t big enough to absorb losses. In a nutshell, mid-cap and small-cap stocks have the potential to deliver higher returns but with greater volatility and risk than large-caps. Large cap stocks are more stable. Now that we’ve got this basic rule out of the way, let’s get down to the funds. There are a few thousand stocks traded on both exchanges spanning market capitalisations. How does a fund figure where to invest? That is defined by the type of fund it is. A large-cap fund puts most of its portfolio in large-cap stocks. They aim to play only on the large-cap space and usually have the Nifty 50, Sensex, Nifty 100, or BSE 100 as benchmarks. At FundsIndia, we consider stocks with a market capitalisation of over Rs. 15,000 crore to be large-caps. Examples include Franklin India Bluechip, ICICI Prudential Focused Bluechip, DSP BlackRock Top 100, Invesco India Business Leaders and so on. On an average, the proportion of large-caps stocks in large-cap funds is about 80% of the portfolio. Some large-cap funds include a measure of mid-cap stocks (usually about 15 to 20% of the portfolio) in order to boost overall returns. Examples of such funds are SBI Bluechip, Axis Equity, BNP Paribas Equity, Kotak Select Focus, and so on. Because of this leeway to include mid-caps, such funds are slightly riskier. Large-cap funds form your portfolio’s foundation or the core. Since large-cap stocks are less volatile and have superior market liquidity, their returns do not see very wild swings unless the broad market itself crashes or booms. These funds provide stability to your portfolio and are therefore a must-have. A mid-cap or / small-cap fund invests primarily in smaller companies. The universe of stocks here is huge. We define mid-cap stocks as those with market caps of between Rs. 2,500 and Rs. 15,000 crore. Stocks below Rs. 2,500 crore are small-caps. The degree of risk depends on the level of marketcap of the portfolio. The range of risk levels in mid-cap and mid-and-small cap funds is therefore wide. Funds like DSP BlackRock Micro Cap, Reliance Small Cap, or Franklin India Smaller Companies pick funds from the lower end of the range – or small companies – thus becoming the riskiest. These are small-cap funds, or mid-and-small-cap funds. Equity funds oriented towards the higher end of the range are mid-cap funds – like HDFC Mid-cap Opportunities, Tata Equity PE, BNP Paribas Mid-cap, Mirae Asset Emerging Bluechip and so on. They have limited to no exposure to risky small stocks. Given the high risk-high return nature of these funds, they help boost portfolio returns but are not the core. No matter what your horizon or / risk appetite is, it is prudent to cap allocation to these funds at about 40% of your portfolio. Generally, shorter-term portfolios of about 3 to 4 years should not have a pure mid-cap fund unless you are a very high-risk investor. 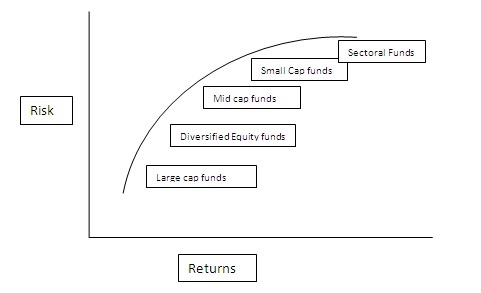 A diversified (multi-cap) fund does not have a strict marketcap orientation. Depending on opportunities, these funds can switch between being large-cap or mid-cap. On the risk-return curve, these funds fall between large-cap and mid-cap funds. Multi cap funds can get a bit tricky as there are funds that steadily maintain a higher exposure to large-cap stocks (like Mirae Asset India Opportunities or Franklin India Prima Plus) while others are far more flexible (like Reliance Equity Opportunities or / Franklin India High Growth). As you now know very well, those with a larger market-cap tilt are less risky than others. Most ELSS funds are multi-cap equity funds by nature. These funds are useful to provide the return kicker if you don’t have the risk appetite required for pure mid-and-small caps. They’re also useful in portfolios with shorter time horizons as they provide limited mid-cap exposure. Sector or / theme equity funds also do not restrict themselves to market capitalisation. But they are the highest-risk funds because their performance depends on whether that theme or sector is doing well or not. These funds should never be a part of your long-term portfolio. They require timed entry and exit, and serve only to make money for the duration that a theme is favoured by the market. Balanced funds also have their equity portion spanning market caps. Most balanced funds, therefore, often have some exposure (between 15-25 per cent of the portfolio) to mid-cap stocks. But as they put a quarter of their portfolio in high-quality debt instruments, on an overall risk level, they are lower than even large-cap equity funds. These funds are good at providing the needed debt exposure to a portfolio, especially when the investment amount is small. To make for easier understanding, in our Select Funds list, we group equity funds into moderate risk and high risk (we do this for ELSS funds as well), depending on their average exposure to large-cap stocks. Funds that fall in the moderate group are oriented towards large-cap stocks. The high-risk group takes higher mid-cap exposure. Our marketcap cut-offs are reset periodically based on overall market movement.